I will use the previous concept "break:in". The concept will be changed for making solid modeling with 3d Printer. The 3D Printer can print man unmakable model so, I want to make the inner breaking part are solid form. But the outside will express the reason, so both are will be solid form. How can express both? I think about the two ideas. The one is pin hole. The inner solid (breaking part) are expressed frame or thin surface like a fabric. The outside are solid surface has pin hole in edge. So, people can see inside with this hole. The second idea is using light and shadow. The innerside has little gap between each breaking fragments, and the outside are thin solid. So, I will install light inside cube, the light will show inner fragment. I try using light idea at first. The new structure are dropping box and collision with floor. At first, I tried previous model has the inner fragment are spreading shape. 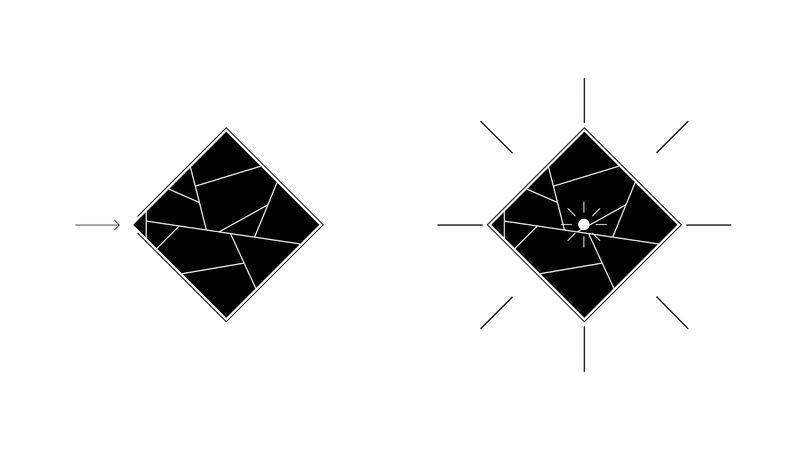 But this time, the fragments are making original shape (cube). It means the results are show one possibility in number of cases, something like a predict or foresight. The fragment have to have gap between each other because the light will spread to outside. The plugin that voronoi is not working completely, so I have to trim the vertex and surface for shape. The outside will be thin surface for spreading the light. But I can not sure the light can out from inside and the fragments are be shown in outside. So, I have to experiment previous final model.